The Deluxe Hand Crafted Wooden Ship Wheel With Pirate's Nautical Ship's Porthole Mirror The wood which with which this thing is made out .......Is just a sheer solidity! Crafted with precision and passion , the quality of the picture can be seen through the pictures itself!. This is not some made in China stuff , this is quality product with quality craftsmanship!. Being the largest manufacturer for these Amazing Nautical Ship Wheels we understand the market better than our rival friends and provide you the best possible nautical decor , which is right there infront of you ! . We sell exactly what we show unlike our competitors! You get exactly what you see ! Keep exploring Nagina International for more Amazing gifts and decor to full fill your nautical needs!. We are here to serve you for ever and we will keep impressing you with our outstanding crafted products! 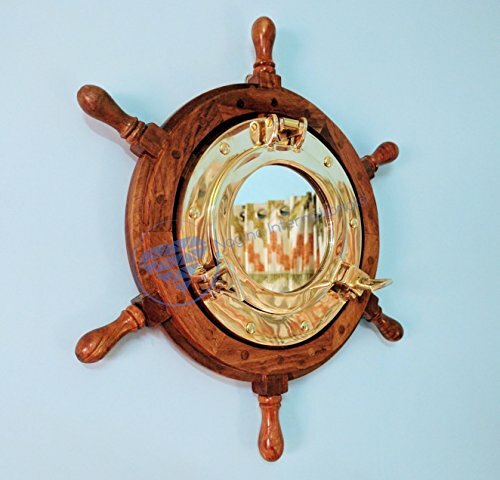 Premium Solid Wood Crafted Nautical Ship Wheel | Varnished Coated Finish! Size : Across The Handles | Many More Decor To Choose!